Getting Grey Hair Should You Color It? Hi. I'm sitting at home in my office. Actually, I was working on the salon website. Something struck me, a conversation that comes up a lot in the salon quite regularly about grey hair. 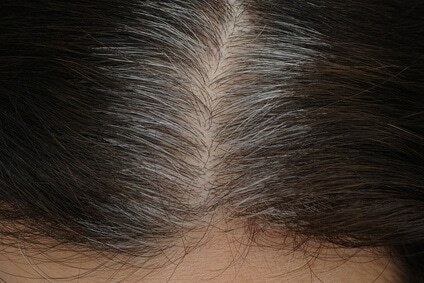 One of the posts that we get an awful lot of response from on the site is around about grey hair. Grey coverage of hair is a big issue. I thought I would break the tradition a bit. Okay, when I've done this in the salon with customers, they found it really quite interesting. I thought I'd share with you why your grey ... If you're doing your own grey hair color and your own coloring , why it may not be working and two, what you'd have to do to make it work better. You might think, Iam , you're throwing away the keys to the kingdom. Well, I'm hoping that once you read this you'll realize why it probably cost and time and a lot of other factors that it might be worth wandering over to good old Impressions and getting it done. As they say, share first. Here I go. If you've been coloring your own hair at home and you've been struggling to get it covered, there's a general arc that goes. Some people start coloring their hair when they're very young for fashion purposes and that’s generally fine or less they go really mad and go blond or something really technical, or they tend to go too dark. They tend to find it's kinda of okay if they go a steady line. Unless they want something very technical, they're okay. Then, the arc moves and you tend to find that people go more whiter through the front. . The fact is way we go white normally isn't very even. We can get a lot through the front and hardly any through the back. Very Irritating! As you color it yourself, you tend to find that those bits at the front suddenly aren't covering very well. If you're putting a brown on your hair and suddenly it's looking a bit orangey on the sides or something like that or wherever your patch of white is, and that starts to become an issue. That's where the classic, people's hair going too dark comes from because one way people deal with that is by going too dark. Going darker to cover the orangey bit or whatever they're seeing in their hair. Sadly this solves grey hair but creates another problem especially as you get older. Why is this? Why does this happen and how could you avoid it? Well, basically when a color manufacturer makes color, they make it as a blend. If you could see in Impressions our color room, our color room is full of about over a hundred tubes of color with different colors. When we come to make a color, we mix. Put very simply, you'll have a base color, which is really what gives you depth and your grey coverage and a fashion color, which is basically what gives you the color that you see. Be it red, brown, or whatever. It's not quite that straightforward, but roughly that's it. Manufacturers of color make a blend. Something that will cover a certain amount of grey, not look too dark or flat, have a certain amount of red or brown or whatever that person wants in it, and a certain amount of coverage. Once you tip over that arc and you reveal in certain areas of your hair, a lot of grey or a patch of grey, of course the color can't cope. The solution, if you want it, is that you've got to find a base color and a fashion color and thenmix the two together plus and know which ones to mix. Now even if you knew what to do, think of the cost. If you buy your own color now, you know how much it costs. Think about if you were buying another packet or perhaps even another packet on top of that. You can start to see where I'm going with this. All right, I've got my stall to set out. I'm a hairdresser. I want you to come to us for color. explaining to you why your colors may not be covering and that is the reason why. That is the solution. Unfortunately, the reality is, you don't have that solution at your disposal. The only option most people have is to buy color that will cover it, which is a darker color, which means people end up with dark color. As their skin tones get lighter, as they get older, which they all do. I think from the age of 21, our skin tones are getting lighter. Depressing I know, but there you are. You are left with a dark color that you can't get lighter and you're stuck. In a lot of cases, and this is why you see people who are older with too dark a color. We don't want to end on a negative note, do we? No, we don't Lee. The Pitch- You Knew It Was Coming Didn't You! Obviously, you're going to know that I'm going to pitch to say, come to us. All I'm saying is, look up our 6 weekly color price and then take off what you pay for a haircut and a blow dry normally without a color, thats what in real terms the color will cost you. Then work out how much you are paying for one box of color from the shops. Then think about if you have to buy another one or two, then consider your level of expertise, , just the materials can mount up in costs. Then think, is it all worth it? Anyway, have a great day and if you need advice about color, remember you can come in just for a consultation. We won't trap you with myself or Claire and see what could work for you. Anyway, bye for now.